I have had this photo hanging in my house for several years from a fall festival sunflower maze that my children wandered through when they were younger. I thought it would be great to paint. It was more difficult than I thought, the darks and lights were more difficult to capture than I anticipated, and I had some trouble with the shadows. Trying to fix this and get the shadows the way I saw them, I overpainted a bit... I just thought if I try this one more thing... maybe I will like it more. I finally decided it was time to quit and move on to the next one. I have started another of a dog and a snowman, my only goal is not to overpaint! I think you nailed it Maria. A great painting of a beautiful flower. Sunflowers are so much fun to paint, but yes, they have their fair share of challenges...I agree. Thanks Gretchen and Theresa, you are so....good for my confidence! 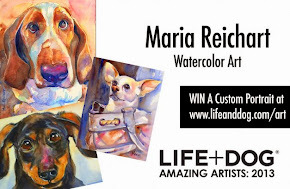 This is really lovely Maria, I like the gesture of the sunflower! I tried my first watercolor yesterday and let's just say I will be sticking with oils!! I really think you did a beautiful job. I especially like the composition and your details. Thank you Dana and Leslie, I think I will try more flowers...eventually...and I would love to try oils some day...my mom painted in oils and I have always wanted to try. It is on my list of things to learn. It is a long list! Thank you so much, flowers are still a bit of struggle for me, but I keep trying! Oh Maria!! This is beautiful.. I see no such thing of overpainting on this one. 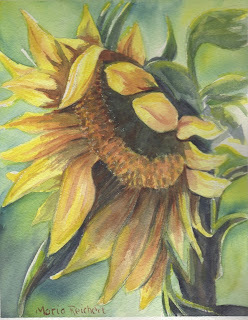 I have been wanting to paint a watercolor of a sunflower for quite some time now and have not yet attempted it. Great job. Thanks Jennifer, I look forward to seeing your sunflower paintings, I will watch for them, but meanwhile, your portraits are amazing!